Equipe Sport, online at equipesport.com, is a premier destination for ski and snowboard gear and apparel. Equipe Sport offers top brands like prAna, Salomon, Burton, Arc'Teryx, Patagonia, Smartwool, SMS, and more. 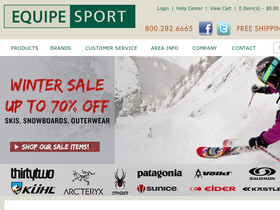 Equipe Sport carries a variety of products, including skis, boards, ski bindings, boots, outerwear, accessories, and more. Equipe Sport also has a sizable sale section. But before you shop, get all the latest Equipe Sport discounts, Equipe Sport promo codes, and Equipe Sport coupon codes found here at RetailSteal.com. Equipe Sport offers shipping promos that change often. Stop by RetailSteal.com for the latest Equipe Sport shipping special offers. Save 10% on your purchase at Equipe Sport using the coupon code. Click here to shop. Use this Equipe Sport coupon code online and enjoy a $20 discount on your order of $200+. Save up to 70% in the clearance at Equipe Sport. Click here to save on Patagonia, Spyder, Thirty-Two, Rome, and more. Enjoy free shipping on all orders at Equipe Sport. Click to shop. Save 50-75% on the skis sale at Equipe Sport. Click link to shop. Save up to 40% on the outerwear sale at Equipe Sport. Click to shop. Save up to 40% on snowboads on sale at Equipe Sport. Click here to shop.